I’ve been going out on the weekends a lot with a t-shirt and super fun oversized ribbed knit scarf with the most overindulgent fringe ever. MsNovak sent me this amazing scarf during the summer’s Seasonal Scarf Swap. I think it’s my favorite scarf EVER. So some of these times when I’ve been going out in my t-shirt and scarf it’s been kind of cold. I kept playing with the scarf and wrapping it around my arms like a sleeve. I realized what I really needed was a multi-purpose scarf that could be used as sleeves when needed. I had seen pictures of some scarves turned shrug and browsed through some patterns, but they all seemed more like summer patterns, so I made one up. Just over 2 skeins of Loops and Threads Charisma (around 230 yards of Bulky weight yarn). 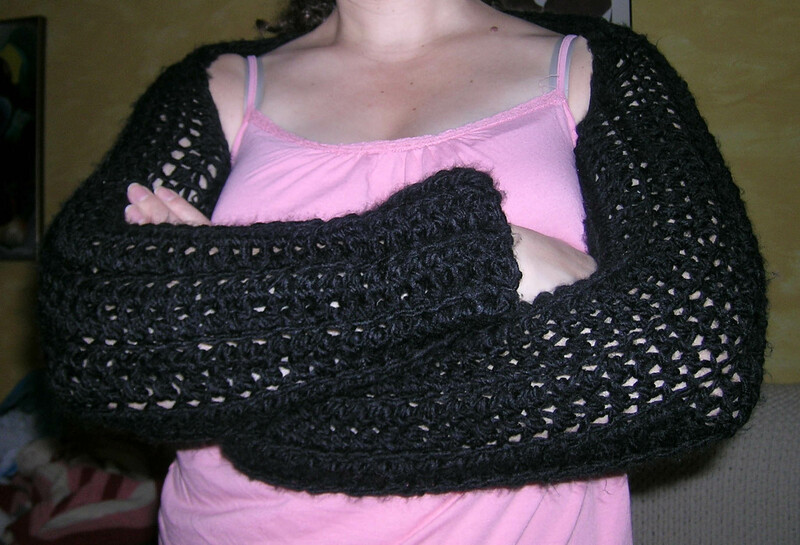 Pattern has negative ease and is tight and stretches to fit a size Medium/Large for someone 5’6″-5’9″. Dimensions: 53.5 inches long and 8 inches wide at the unseamed center. The SleevoScarf does have a lot of stretch. Row 2: Ch 2 (does not count as first stitch), turn, HDC through both loops in first stitch, HDC in back loop only across to last stitch, HDC through both loops for last stitch. Row 3: Repeat row 2 until you have 13 rows. Finish off leaving a long tail to sew the first arm. 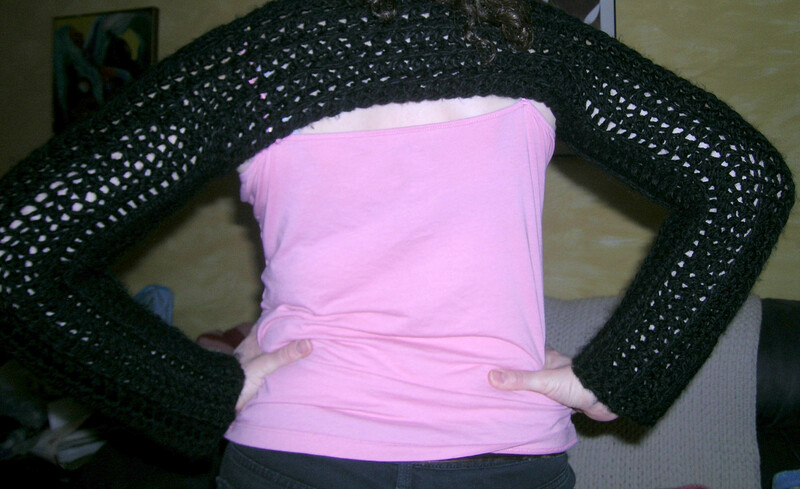 I used mattress stitch to sew the arms, but you may want to use a stitch with more stretch. 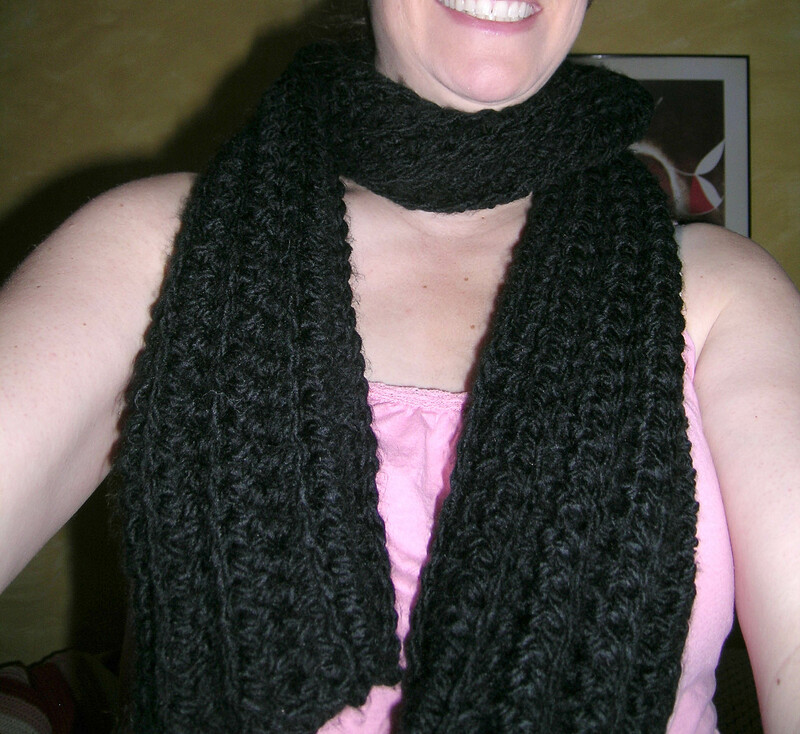 Fold the top of the scarf to the bottom row of the scarf and sew 21″ for the first arm. Try on to make sure it fits, you may want to sew it a little more or take out some stitches. Sew the second arm. Weave in the ends. Wear as a scarf until your arms get cold, then wear as sleeves. I am currently working on two other versions, in Worsted weight and Bulky weight yarn, that you can wrap around your neck and wear as a scarf and sleeves at the same time. Be on the lookout for those patterns soon.